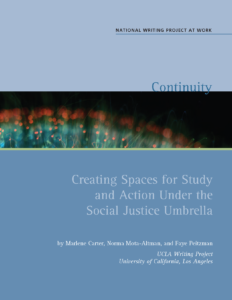 Summary: This monograph provides an in-depth look at the UCLA Writing Project’s approach to exploring two social justice concerns—matters of race and issues of homophobia—and the design of two multiyear study groups that engage the learning community at the site. The authors chronicle how both study groups were moved to take action as a result of their work together, and describes the programs they created and the impacts of these programs. Finally, the authors reflect on how these study groups have impacted the work of their site, and on the significance of nurtur­ing long-term, focused continuity work for teachers. The monograph would be useful for teacher leaders interested in organizing and leading study groups focused on social justice issues, and/or in learning about strategies that support honest conversations among thoughtful colleagues. The sections that follow present structures and activities that capture two aspects of our work: a consideration of our own identities and attitudes and a focus on working with students. We recognized that the phrase “hard conversations” means those discussions that push members to articulate thoughts, feelings, and stances that may or may not be acceptable to others. The topics are high-stakes; often there is a fear of being misunderstood or being caught in ignorance. Sometimes these conversations are planned; that is, we willingly agree to make ourselves vulnerable in order to break new ground. Just because they are planned, however, doesn’t mean they are “dummy runs.” We can’t avoid the emotional pull of the topics. We can “practice,” but the practice doesn’t stay on an intellectual level (Montaño et al. in draft).